Sapphire has been mined in Ceylon for centuries, but Madagascar became known for sapphire a mere 15 years ago. When major sapphire desposits were found in Madagascar in 1998 the country was gripped by a gemstone fever reminiscient of the 1849 gold rush in California. The deposits were so important that by 2007 Madagascar had became the leading producer of high quality sapphire in the world. Madagascar is an enormous island located in the Indian Ocean off the southeastern coast of Africa. It is the fourth largest island in the world -- after Greenland, New Guinea and Borneo -- with a land area of more than 587,000 sq. km, larger than Thailand, Spain or Sweden. But due to its isolation, Madagascar has a unique ecology, with more than 80% of its animal and plan species found nowhere else on earth. Madagascar was an independent kingdom that became a French colony in 1886 and regained its independence in 1960. With a population of about 22 million, it remains one of the poorest countries in the world. But geologists believe that the country has some of the richest untapped mineral resources in the world. The discovery of significant gem deposits began with some small finds in the southern part of the country in the early 1990's. But the major sapphire deposits discovered in 1998 in the tiny village of Ilakaka in southern Madagascar came as a huge surprise to the gems world. The country is now known to have sapphire deposits in both the north and south regions. The two regions are geologically distinct. Sapphire deposits in the far north result from alluvial deposits of weathered basaltic rocks, while those in the south are of metamorphic origin. 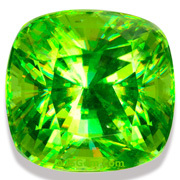 Many of the blue sapphires from the north have a green secondary hue, while those from the south tend to be a pure blue. 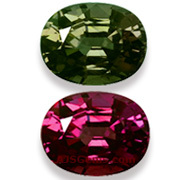 Madagascar is most famous for blue sapphire and ruby, but many different colors of corundum have been found, including pink, yellow, green, white and padparadscha. Some fine color change sapphires have also been found, that display blue or violet depending on the lighting. However, it is not just the quantity and variety of material that has made Madagascar so important as a sapphire producer. Rather it is the combination of the quality and size of the gems, a combination that had not been seen in the gems business for many years. As gem mining has developed, high quality specimens of other gems varieties have also been found, including aquamarine, morganite, rhodolite and color change garnets, tourmaline, apatite and sphene. Mining in Madagascar is still in the early days and we expect that significant new deposits will continue to be discovered. Just last year huge sapphires and rubies were discovered in a national park near Didy in northeastern Madagascar. Miners rushed to the mine but the police soon cordoned off the area to prevent illegal mining in the forest preserve. This month we feature fine untreated gems from Madgascar, including sapphire, ruby, aquamarine, garnet and sphene. An exceptional 2 carat unheated ruby in a vibrant pure red. 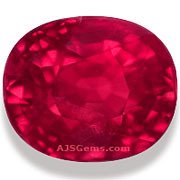 This rare gem displays remarkable clarity for ruby (graded "almost loupe clean"). Certified as natural and unheated by Tokyo Gem Lab (TGL). A gorgeous example of the fine Malagasy color change garnet in a large size. Displays a great color change to a deep strawberry under incandescent light. Very clean (graded "almost loupe clean") and well cut with full brilliance. A sweet pink sapphire with great sparkle and fire. 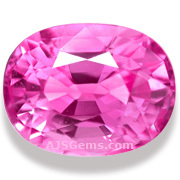 Nice shape with excellent luster, this is as pretty a pink sapphire as you will find. This fine gem will make a romantic piece of jewelry that you and your family will treasure. Certified as natural and unheated by Tokyo Gem Lab (TGL). According to a story in Diamond World, Dr. Dietmar Schwarz, long time head of research at the Gubelin Lab in Lucerne, will join the Asian Institute of Gemological Sciences (AIGS) in Bangkok as director of their laboratory. Dr. Schwarz, one of the leading research gemologists in the world, will reportedly take up the position in Oct 2013. A lone armed gunman stole gems and watches worth an estimated $136 million from an exhibition of Leviev diamonds at the Carlton Hotel in Cannes on July 28th. The theft took place at midday, in the presence of 3 unarmed security guards. The Carlton is where Alfred Hitchcock filmed To Catch A Thief, his 1955 film about a jewel thief operating on the French Riviera. A BBC new story from July 30th notes the growing popularity of colored gemstones around the world, as more women (and men) choose colored stones for engagement rings and other important jewelry purchases. One effect of changing consumer preferences is that prices for sapphires and rubies have risen faster than diamonds over the past 8 years. Generally it takes an experienced eye and some gemological knowledge to detect glass-filling in sapphires. Sapphires that have been filled with cobalt-doped glass will show a strong red or orange-red when viewed under the Chelsea filter (natural and synthetic blue sapphire will not show red). In addition, the glass-filled sapphires will not display pleochroism when viewed with a dichroscope, since the blue color comes from the cobalt in the glass rather than from the structure of the sapphire. For the consumer, price is your best clue. If you see blue sapphire selling for $25 or $30 a carat, you can be fairly sure that is either glass-filled or synthetic. Tanzanite has many attractions. The highest grades of tanzanite display a vivid violetish blue that rivals fine sapphire. Tanzanite can also routinely be found in larger sizes (over 4 carats) that are very rare in sapphire. Tanzanite also tends to have excellent clarity, and loupe clean specimens are not uncommon. But tanzanite is not nearly as durable as sapphire -- it has a hardness rating of 6.5 compared to 9 for sapphire. The main reason that blue sapphire is subtantially more expensive is its rarity. 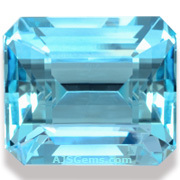 Clean sapphires in a saturated blue are very rare, especially in sizes over 2 carats. Prices on fine sapphire tend to rise exponentially with carat weight, while tanzanite prices per carat tend to be fairly constant even in larger stones.